According to the U.S. Department of Transportation, there are more than half a million for-hire carriers on file with the Federal Motor Carrier Safety Administration – and 97% operate fewer than 20 trucks. Comdata recently shared with us some research it’s done on small fleets of 100 trucks and fewer. Out of its respondents, the biggest group was the 2-10 truck segment at 53%. Keeping those trucks loaded is a top priority for small fleets, with 46% of respondents searching for loads daily, and an additional 27% looking for loads two to three times per week. As nearly half of fleets are searching for loads daily, this implies that they either lack regular customers, or at the very least need to find backhauls, Comdata notes. One fleet owner from New York told Comdata that 90% of her fleet’s loads come from direct customers, but she still looks for loads on load boards daily, whether for LTLs or backhaul. Of its respondents, 46% of fleets with 2-10 trucks look for loads daily, and 61% of fleets with 11-20 trucks look for loads daily. Fleets rely most heavily on load boards, with over 76% of respondents using load boards and 68% using brokers. Many described load boards as a last resort; they will first use personal contacts, such as calls and emails directly from brokers they’ve worked with in the past, and then use load boards for brokerages (such as Coyote or Landstar), and then use a load board such as Truckstop.com or DAT, Comdata explains. Respondents repeatedly cited their comfort with working with trusted repeat customers, and were willing to take a slightly lower rate from them because they were guaranteed payment. Despite all the hype about “Uber for Trucking” load-matching apps, only 2% reported using Uship or similar websites. There have been a number of new entrants into this space since the research was conducted last year. One of the biggest challenges beyond keeping the trucks loaded is making enough money on those loads. When asked about their three biggest challenges, 29% of the Comdata respondents reported their biggest challenge as revenue per mile. They discussed the low rates being offered by shippers and brokers, and the fact that it is difficult to cover expenses. The current rates have led to both a general feeling of animosity toward brokers, who carriers hold responsible for the low rates, Comdata says, and a feeling that it is impossible to grow one’s fleet given the current rate climate. A big challenge that many respondents share with larger fleets is finding and retaining drivers, with 24% of respondents reported that to be their biggest challenge. A fleet financial manager from Missouri with 30 trucks stated that she had four or five open trucks that she needed drivers for at the time of her interview. 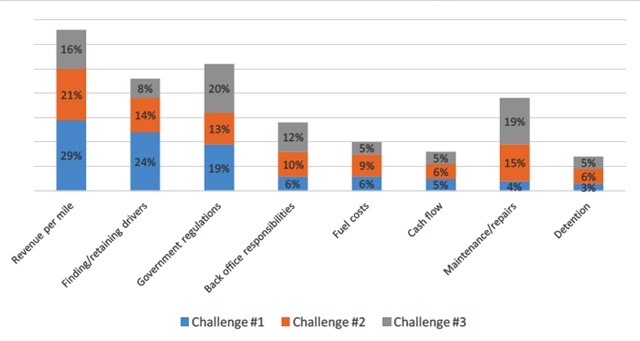 Government regulations was another big challenge, with respondents cited their frustrations the ELD mandate, hours of service, and other safety and compliance challenges. It was repeatedly stated that it is difficult for small fleets to keep up with ever-changing regulations. Again, this is a challenge shared with larger fleets, as regulations – the ELD mandate, HOS, and the cumulative effect of regulations – were the three highest industry issues on the ATRI’s list of critical issues within the trucking industry in 2016. 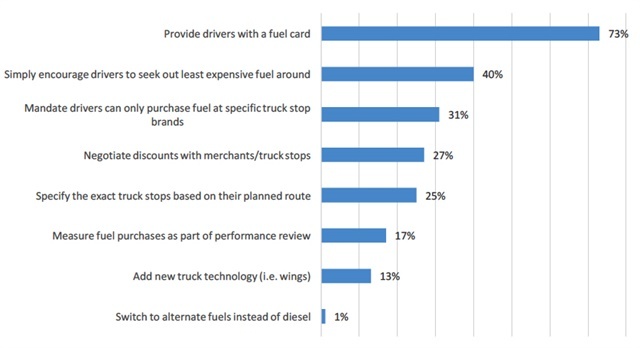 When asked how they minimize what they spend on fuel, 73% of respondents provide their drivers with a fleet card which they use to purchase fuel. 40% of respondents encourage their drivers to seek out the least expensive fuel around. 31% of respondents mandate where their drivers can make fuel purchases, citing specific truck stop brands. 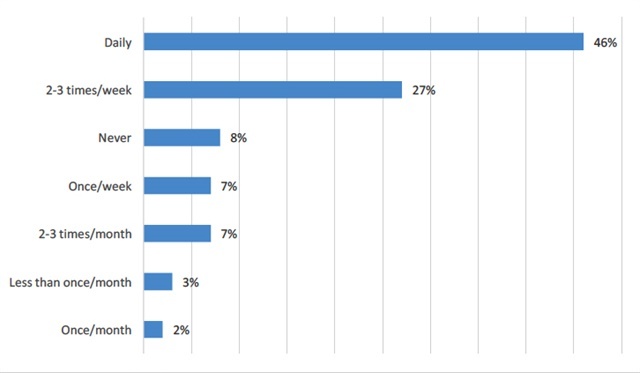 The majority (79%) receive discounts through their fleet/fuel card. 27% negotiate discounts directly with merchants and truck stop brands. 25% participate in group discount/rebate programs through aggregators such as Truckers B2B. 21% report receiving no discounts at all. 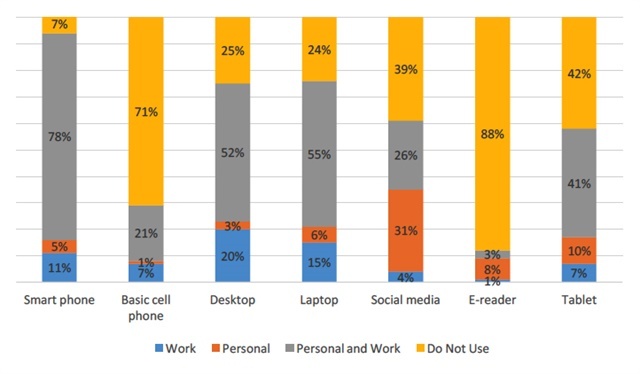 When asked whether they use specific pieces of technology for work and/or personal purposes, 78% of respondents said use a smartphone for both personal and work purposes, and an additional 16% use smartphones for either personal or work purposes. In addition, 55% of respondents use a laptop for personal and work purposes and 21% use a laptop for either personal or work purposes. Some respondents spoke of their frustration with using an app versus the website for popular trucking sites. One fleet owner from Florida with three trucks cited the difficulty with using the app version of a popular load board, as it does not self-refresh and is less convenient. This respondent prefers to use a laptop and work via the website; Comadata says this illustrates that while these small fleet owners and managers have smartphones and are tech-savvy, they still prefer to use their computers for certain functions. After conducting this research, Comdata expanded its options for smaller fleets.